The selection meeting for the Winter issue of Cast On was on Tuesday. There were lots of lovely submissions. The lessons for the issue are felted handbags and pleats. After the selection meeting we drove up to Cleveland to visit a friend who is at Case Western. We had planned on going to the Rock and Roll Hall of Fame but since we had been there before we spent our time at the Art Museum and Botanical Gardens. Both were lovely. On the way back we stopped at Ohio State University. Before I left I upgraded my iPad to the new model. I had the original one...no camera. I practiced my photography skills at the Art Museum. It looks like it captures color better than my old camera. I am hoping to use it for my videos as well but it doesn't work with my tripod. I need to find a helper. Again, my students are so considerate. No lessons arrived while I was gone. Thank you so much. Now get back to work! Decreases Part 2. This week I will discuss the SSK decrease which is the preferred technique in the US. (In Britain and Japan, the preferred technique is SKP which I will discuss next week.) As I said last week the goal in making mirrored decreases is that they are approximately the same size. If the decreases on one side are larger, the symmetry is disrupted. This isn't an easy thing to accomplish since the K2tog decrease technique produces a very neat and tidy right slanting decrease. In the photo below, no care was taken when making the SSK decrease. Notice that they are larger than the K2tog decreases. Why is it so hard to match the K2tog decrease. 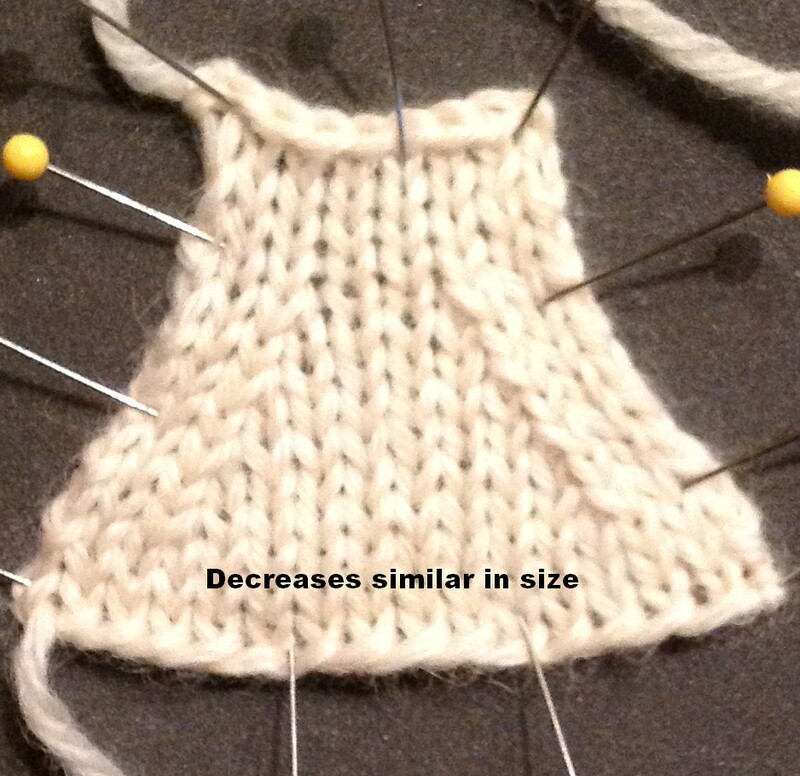 To have the decreases slant to the left AND not be twisted, you must slip a stitch or stitches. 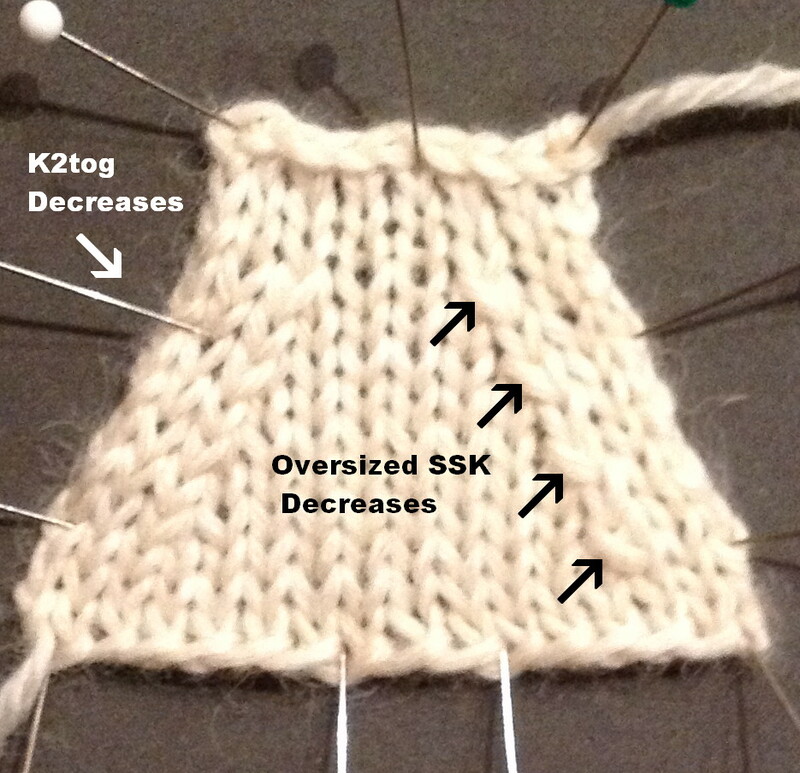 For SKP you slip one stitch and for SSK decreases you slip two stitches. 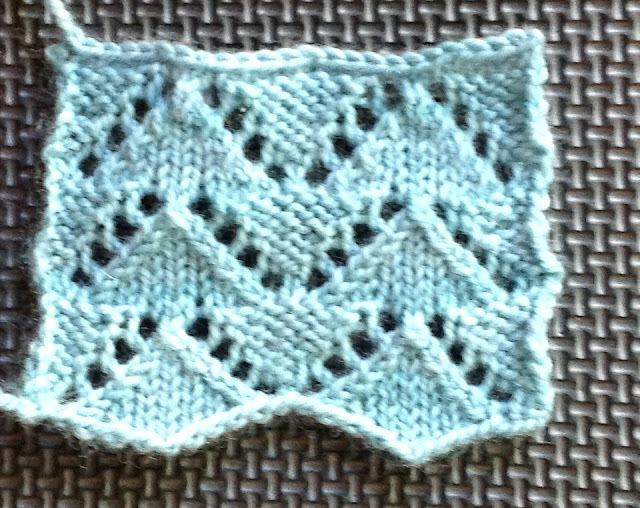 Whenever a stitch is slipped, it is easy to stretch it out. Unless you are very careful when making an SKP decrease, it is larger. SSK decreases came about as a solution to this problem, the logic being that since two stitches are slipped the stretch is shared. As the photograph above shows, this isn't a guarantee. There are several things you can try which I demonstrate in the video for this week: SSK Video. The first thing to try is to avoid stretching out the stitch in the first place. Use just your needle tips to slip the stitches and make the decrease. I've been playing with something else for a while as well. One day I took time to analyze the process of making an SSK. When you slip the stitches and return them to the needle, what you are really doing is changing the orientation of the stitches on the needle so they will not be twisted when you knit them together through the back. You can also change the orientation of the stitch by wrapping it the wrong way on the previous row. When you purl, you wrap the yarn OVER the needle. If you reverse this, the orientation is changed. So I tried wrapping the stitches the wrong way on the row BEFORE the decrease. This way you don't need to slip them at all. You just knit them together through the back loop on the next row. If you try this be careful not to wrap the stitches too tightly on the previous row or you get itty bitty stitches. What you will also see in some reference books is to slip just the first stitch and then work the decrease. Don't do this for the swatches in the Masters Program. If you do, the second stitch is twisted. (I'll go into twisted stitches in a later Tip of the Week). As I recall the last step gives you a twisted stitch so if you are working on swatches for the Masters Program, avoid this. Am I brave or what? Here is a photo left slanting decreases which are SIMILAR to K2tog decreases. Are they perfect? No. As a last resort what you can do BEFORE blocking is to get a tapestry needle to manipulate the size of the stitch on top. 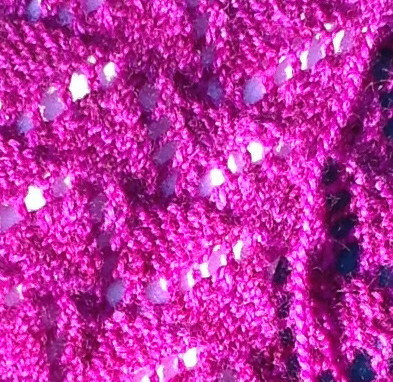 You can try and shift some of the excess to the selvedges or to the stitch underneath. Would I bother to do this for most projects? No. But I would give it a try for the decreases along a neckline. Salon will be on Saturday from 2-5 pm. Yes, I know it is the third race of the Triple Crown but since the race is at 6:40, I figure people can still get to their parties. I'm finishing up the last pair of birthday socks. I really have to get started on my projects for Cast On. I do have the yarn for the Dread Snowboarding hats but none of the rest of the yarn. I just have to weave in ends. 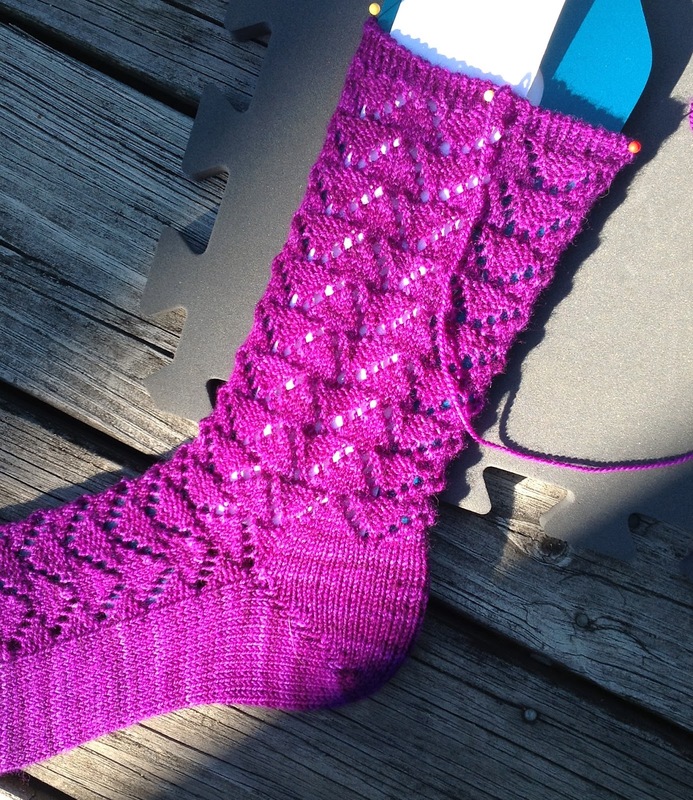 I've finished one of the socks for Martha who loves purple. This is a pretty accurate photo of the color. The yarn is Yummy from Miss Babs and the color is Impatiens. It is so purple it hurts my eyes! 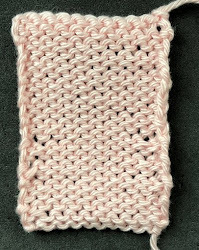 The stitch pattern is one I adapted from a Japanese stitch dictionary. It is a very stretch pattern which makes it ideal for wider ankles and calves. The original used S2K1P decreases in the center of the stockinette triangles. I didn't want any decrease lines so I used K2tog decreases on the right side of the triangles and SSK decreases on the left. If you check out last week's blog, you'll see this is full-fashioned shaping. I actually swatched to see which I preferred. Compare this swatch to the one last week and you can see the difference. Here is a close up of the sock so so you can see how it worked out. 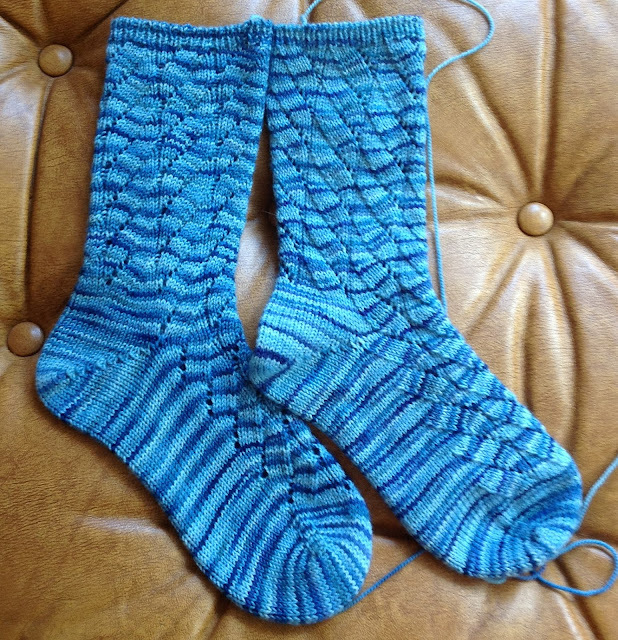 I hope to finish the second sock tomorrow. I just watched your video on SSKs and I think you've just changed my life! I can't wait to go practice my SSKs.